This article covers the process of determining whether you are exceeding resource limits on your DV server. It will also cover basic troubleshooting procedures, and help you determine the appropriate course of action if you are frequently exceeding resource limits. This article assumes that you are familiar with the basics of viewing resource usage on your server, as well as the resource parameters. For more information please review How can I see my server's resource usage statistics? If you're having trouble with the steps in this article, additional assistance is available via CloudTech, our premium services division. Our expert engineers can tweak and tune your server for optimal performance. For more information on what CloudTech can do for you, please click here. Please keep in mind that the DV product is a self-administered hosting solution. This article is provided as a courtesy, and the material covered is outside the scope of support provided by Media Temple. Please take a moment to review the Statement of Support. On the DV, the User Beancounters resource allocation system has been replaced with VSwap, which simplifies the process of memory management and troubleshooting. VSwap provides virtualized swap memory to your server if it exceeds it's guaranteed allocation of RAM. Please note that this is different than standard swap memory, because it is not actually written to disk, but it is considered to be equivalent to traditional swap in terms of performance. VSwap is also considered to be more accurate and reliable than the 'burstable' RAM provided through the Beancounters management system. If you suspect your server may be overusing its resources, check your Resource Alerts. You may also want to install the Server Health Monitor utility provided by Plesk. This provides an interface for easy monitoring of several important aspects of your server. 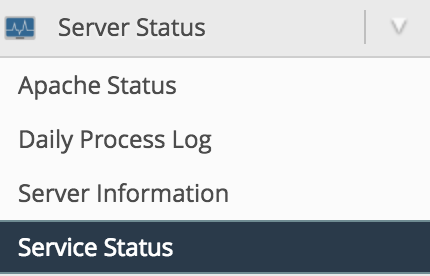 Log into the Server Administration Panel. Click on Tools & Utilities in the left sidebar, then click on the Manage Your Container link. Your Power User Panel will open in a new tab or window. Click on Resource Alerts on the left. Yellow - You are approaching your purchased resource limit. Red - You are approaching the current physical machine resource limit. Black - You have gone over the current system limit. Indicates a crash. Green - Back to normal, safe operating limits. 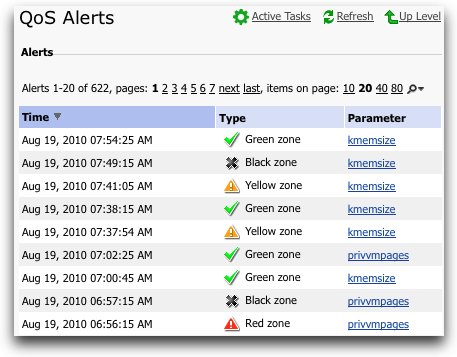 Check the System resource limits section below for details on what the types of alerts mean. 1. To quickly check the status of monitored services, CPU, and disk usage, log into WHM and click on Service Status. 2. All currently monitored services will be listed. Scroll to the bottom for a report on current CPU usage. You may also use this page to add services to monitoring via the link at the top of the page. The beancounters utility returns useful information about server usage statistics. Log into your server as a root or sudo user via SSH. uid - The user ID number. resource - The type of limit in question. See the next section for details. held - The amount of this resource being used now. maxheld - The maximum amount of this resource used in the last 15 seconds. barrier - The dedicated amount of this resource you have purchased. failcnt - The number of times you have exceeded the limit for this resource. Numbers that indicate a memory size are in bytes. The most common system resource limits you may reach are described briefly below, along with the most common causes of such overages. Running too many processes on your server at the same time. Running just a few CPU-intensive processes. Running processes that require intensive server memory. The '-m' flag makes the 'free' command show it's output in MB. The 'Mem' line shows how much guaranteed memory is currently being used. In this case, we are using almost all of it (1015 out of 1024MB). The 'Swap' line shows how much VSwap memory is being utilized. Since we have exhausted our guaranteed memory, we are also using some of our VSwap memory (462 out of 1024 MB). Now you know that you have one or more processes running on your server that are using too much of your memory. There are multiple tools that can be utilized via SSH to track down these troublesome processes. PID - Shows process ID number. USER - Shows owner of the process, useful for identifying hacks. S - Watch out for zombie processes, marked with a Z - these processes have not been properly closed by the program that started them. %CPU - Shows server CPU percentage used. %MEM - Shows server RAM percentage used. TIME+ - Shows how long the process has been running. COMMAND - Shows the daemon running the process. Useful for identifying the general system service that is being a resource hog. Tasks are sorted by CPU use percentage by default. Type SHIFT-M to sort by memory, and SHIFT-P to switch back to sort by CPU percentage. Memory is helpful if you are getting privvmpages errors, and CPU is helpful if you are getting kmemsize errors. When you are done with top, type CTRL-C to exit. See the top manual for more top commands. Similar output can be obtained in TOP by pressing 'c.' This will show you the full path to the command that started each process. PS is helpful because it simply prints the information we require, so that we can quickly utilize that information if necessary. Click on Tools & Utilities in the left sidebar. Scroll down to the Server Management section, then click on the Manage Your Container link. You will see output similar to that mentioned in the top description above. Refer to Step 3 in the previous section. Click on Enable Autorefresh to make the output closer to live. Note that this is not as effective as running top in SSH, because Plesk has to generate graphics. Using the information obtained by TOP or PS, identify which system service(s) are using a high percentage of CPU-time or memory. For example, httpd is Apache, and mysqld is MySQL. This may be enough to identify the exact cause of your problem. For example, if MySQL is the culprit, you can now check your running MySQL queries to see if any of them are extremely inefficient. watch "mysqladmin -u admin -p'`cat /etc/psa/.psa.shadow`' processlist"
If you received generic results from this step, such as the result that Apache is the resource hog, you can use a few more commands to drill deeper into the processes. Continue with the following steps as appropriate. If you suspect you may be hacked, type c in TOP, or run 'ps aux' to view the command that started each current process. If you notice something suspicious, such as a process with USER apache that was not initiated by COMMAND /usr/sbin/httpd, investigate the script listed in the COMMAND section. This shows all of the files currently opened by this process. This kind of output is particularly helpful if you are trying to track down web scripts associated with resource-heavy Apache processes. Run lsof -p as quickly as possible. Many processes last for only a few seconds, and if you don't catch one while it's running, you'll only see the log files as output. dr-xr-xr-x    3 root root 0 Aug 19 14:10 .
dr-xr-xr-x 2485 root root 0 Jun  2  2009 ..
Again, doing this as quickly as possible will give you the best results. Of particular use is the cwd, which shows the directory that the current process is working in. If these steps do not yield useful information, you will need to work with your system administrator to identify the cause of your issue in more detail. Using Apache to serve too much content to too many people at the same time. The best way to determine why you are reaching this particular resource limit is to look at the traffic on all of your sites, especially which pages and files are being requested the most. For example, if hundreds of people are trying to view the same streaming video within a minute of each other, it's probably this item that is causing you to reach the limit. Of course, it's possible that the requests are spread out over many different items as well, which will make this more difficult to analyze. You can check your traffic and web requests by viewing your web statistics. Depending on the issue at hand, optimizing Apache, or utilizing a CDN could help resolve overages of this parameter. Running too many internal processes that have to connect to each other. Run TOP or PS to view your current running processes. Opening too many files at once. Your server may be optimized perfectly, but it may still be receiving more traffic than it can handle. This is especially likely if you don't notice any single process using a lot of your resources, but you see dozens of processes open at once. Check your website statistics to see if you're getting unusually high traffic, then consider upgrading your server - see the Upgrade sub-section the suggested Solutions below. Zombie processes when you run top - check for the letter Z in the S column. Sudden performance drop after installing or upgrading a new software package. MySQL queries that run for longer than 2 seconds. A cluttered list of themes and plugins for your content management system, such as WordPress. You may be suffering from poorly-written software or a bad combination of software components. Contact your software developer for further assistance with custom-written software, or check your software's help forums for help with third-party components. Note that poor software may still be the cause of your issue even if you have none of the above symptoms. If this is an out-of-the-blue occurrence for your server, you may simply need to kill off a runaway process. Occasionally even well-written code can spawn a process that gets stuck for some reason. See the Quick fix - reboot section above for instructions on rebooting your server or restarting a process. If you have identified a specific script or piece of software or even a single MySQL query, that is causing your memory over-use, you should remove or optimize the offending code. You may need to work with a professional software developer or system administrator to do this effectively. When things are not functioning as anticipated, it is always a good idea to check both your general errors logs, as well as domain specific error logs. See System Paths and Checking error logs for their locations. If you aren't using a particular service, shut it down. Purchase a second DV server. Many customers run MySQL from one server and Apache from another server. Keep an eye on your server so you can quickly respond to small resource issues before they escalate. Note that Watchdog tends to be overzealous in reporting problems. You may want to use one of the other suggested programs. Become more familiar with SSH monitoring commands. Learn commands like top, free, cat /proc/user_beancounters, and ps auxx to view server resource usage in realtime. top - See the section on top above. cat /proc/user_beancounters - See Troubleshooting DV Memory Issues . ps auxww - View all processes on your system. Check your system logs. See System Paths and Checking error logs for their locations. Track server uptime externally using Pingdom or Down for everyone or just me?. Maintain up-to-date backups of your server so you can revert your server to a working state in the case of a hack or irreversible configuration issue.